(Bloomberg) -- Almost 10 years after the financial crisis, Wall Street was starting to wonder aloud: Might Goldman Sachs Group Inc. or Morgan Stanley make a big acquisition? In interviews, several analysts predicted both firms will limit themselves to small deals. Representatives of the banks declined to comment. Caveats abound. If either firm spots a golden opportunity, it could temporarily reduce shareholder payouts to free up capital and seek a blessing from regulators. Authorities might embrace a plan that encourages more lending, said Jeff Harte, an analyst at Sandler O’Neill & Partners. “To the extent that they can make acquisitions it would help them grow their loan balance -- essentially put the deposits they already have to use through loan origination -- that could be interesting,” he said. On the other hand, there are all sorts of impediments. For one, the investment banks’ relatively low valuations aren’t helpful, KBW analyst Brian Kleinhanzl said. Their price-to-book ratios are hovering below that of regional banks, and significantly less than that of asset managers, making an acquisition in either space that much harder. There’s also little political appetite to let global banks grow even further, said Karen Petrou, co-founder of Federal Financial Analytics, a research and advisory firm in Washington. And depending on the deal, it could become all the harder for them to clear future tests. Shares of the two firms each jumped more than 2 percent as of 12:45 p.m. in New York as the broader market rallied Monday. Morgan Stanley has dropped 8.5 percent this year, while Goldman Sachs has fallen 11 percent. 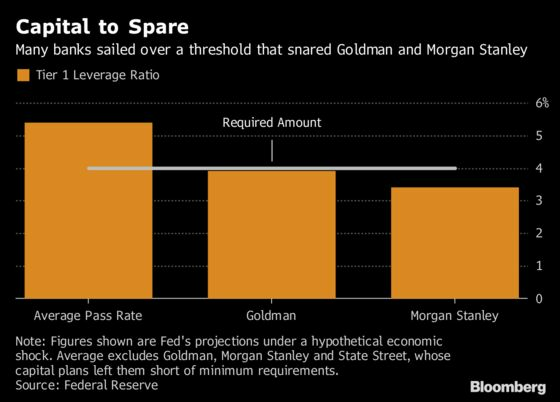 Goldman Sachs and Morgan Stanley both fell short in the Fed’s projections by two key measures, including their Tier 1 leverage ratio. Many other banks, in contrast, were estimated to have billions of dollars of excess capital -- even after they finish their proposed payouts to shareholders. Firms with those buffers would be freer to make acquisitions, if they see opportunities. Investors are recalibrating their expectations for takeovers as the 2008 financial crisis fades and President Donald Trump’s administration eases regulation. Earlier this year, a KBW research report set some tongues wagging about takeovers. 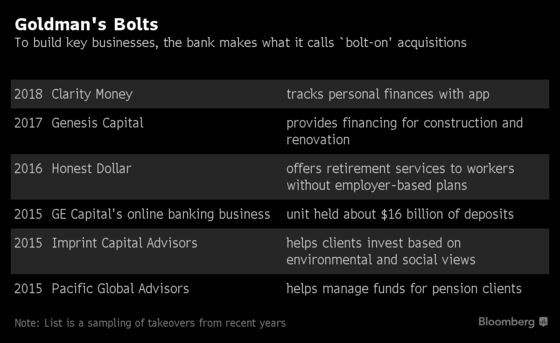 The authors highlighted persistent questions they’ve received from investors on potential deals, and mentioned the possibility that Goldman Sachs could accelerate its expansion beyond past bolt-ons. The stress test results underscore just how unlikely that is, KBW’s Kleinhanzl said in an interview. If they were to pull one off, investors might have to wait many years to see a return.